Written and first recorded by Bruce Springsteen & The E Street Band (1973). Hit version (as “Sandy”) by The Hollies (US #85/GER #22/NZ #12/NETH #9 1975). From the wiki: “‘4th of July, Asbury Park (Sandy)’, often known just as ‘Sandy’, was written in 1973 by Bruce Springsteen and first appeared as the second song on the album The Wild, The Innocent and The E Street Shuffle. Van Morrison’s influence can be heard in Springsteen’s songwriting about his hometown, closely paralleling Morrison’s romanticism of his hometown, Belfast, Ireland. “No singles were released from The Wild, The Innocent and The E Street Shuffle … except in Germany – the first-ever Springsteen 7-inch issued outside the United States – where Springsteen’s ‘Sandy’ met with no apparent chart success. 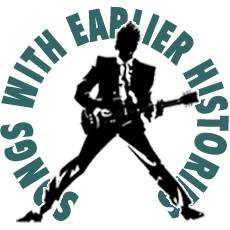 “However, ‘Sandy’ became the first song written by Springsteen to chart, anywhere, when The Hollies’ cover version, released in April 1975, hit #85 in the US, and charted higher in a few other international markets (e.g. Top-10 in the Netherlands). While not a big hit unto itself, The Hollies’ use of “Sandy” presaged other artists mining the early Springsteen songbook for material, a notion that would soon be exploited to much greater commercial success by Manfred Mann and others. “Clarke, too, may have been inadvertently responsible for Springsteen becoming a US #1 hit songwriter: Clarke released a solo album, I’ve Got Time, in 1976 that included his cover of ‘Blinded By the Light‘. Manfred Mann’s Earth Band was also covering the song for their next album. According to Clarke, his ‘record company did not agree that ‘Blinded By The Light’ was the kind of material that would be played on the radio.’ Band leader Manfred Mann was a neighbor of Clark’s in London; Clarke informed Mann that he was not going to release ‘Blinded By the Light’ as a single but thought the song had great potential. As a result, ‘Blinded’ soon thereafter became the second promotional single from Manfred Mann’s The Roaring Silence album. The single reached reached #1 on both Billboard’s Hot 100 and on the Canadian RPM chart in February 1977. “Trivia: Paul Stanley states the Hollies’ version of ‘Sandy’ inspired the KISS song ‘Shandi’.